There are always so many little tiny pieces of yarn that are left over after a knit or crochet project. They get trimmed from color changes, from adding on a new ball here and there and from portions of store-bought yarn that should never have made it through quality control. I hate throwing them away. Ever since I became a spinner (of not-so-fine fibers) I am acutely aware of the potential embodied energy (ie. work) that goes into even a couple feet of finished yarn. 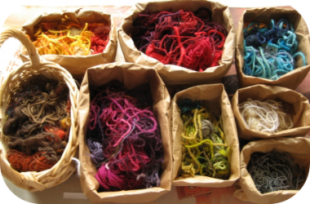 So I collect my yarn ends in a small lunch-sized paper bag and always try to come up with creative ways to use them. 1. Mix with cotton, dried herbs or buckwheat hulls to fill small pillows and handmade stuffed animals. 2. Knit or crochet them into a natural fiber pillow or bag that is to be felted, just pinch them between your stitches or wrap them with your knitting yarn randomly as you work. 3. Lay them on top of raw woolen that you are felting into some groovy shape. 4. Use them for effect in some homemade paper-making. 5. If they are even long enough for 5-10 stitches then work them into a collage sweater or blanket á la Molly Weasely. 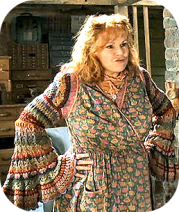 Contrary to popular opinion it does not have to be just like hers to be a “Molly Weasely” creation. Her reasoning was to use up yarn ends and not waste precious materials. 6. Use a little bit of glue and add them to packages, ornaments, etc… for a touch of love and whimsy. Birds love the bits and pieces of yarn to add to their nest in the Spring. I know as a quilter, I hate to throw away any except for the very smallest of pieces of material. I use a tapestry needle to “sew” one end of scrap yarn through another a couple of times to create a totally mish mashed ball and using a pair of medium (usually 6mm) needles knit up a molly scarf/bag/whatever. I would like to buy some yarn scaps…….do u have any?